It’s that wonderful time of the year when violets make their brief appearance, and my yard is filled with the beautiful little deep-purple flowers. 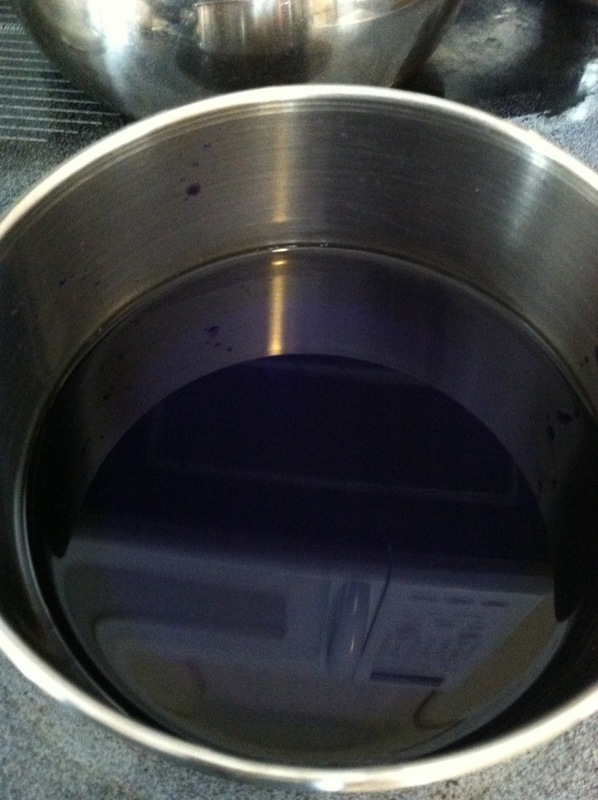 A few years ago, I posted a tutorial on how to make violet syrup, and I thought it would be fun to revive that recipe with a twist. I made the same basic syrup, but added some vodka to the mixture to make a lovely violet cordial that can be sipped by itself or added to other beverages to make a light floral cocktail. 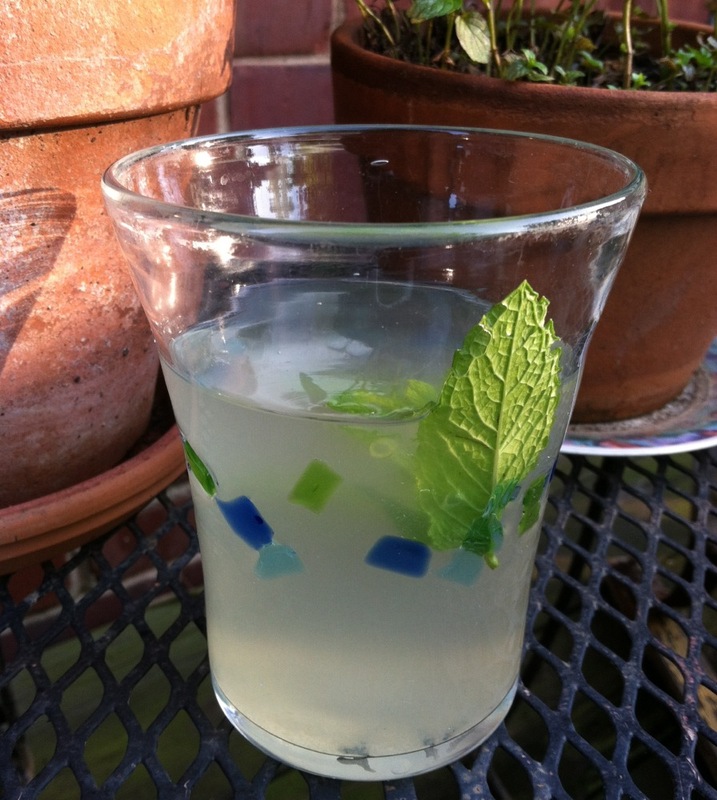 The variety of violets I have in my yard are only slightly fragrant, so the cordial has a mild floral flavor. Different varieties will yield different tastes. 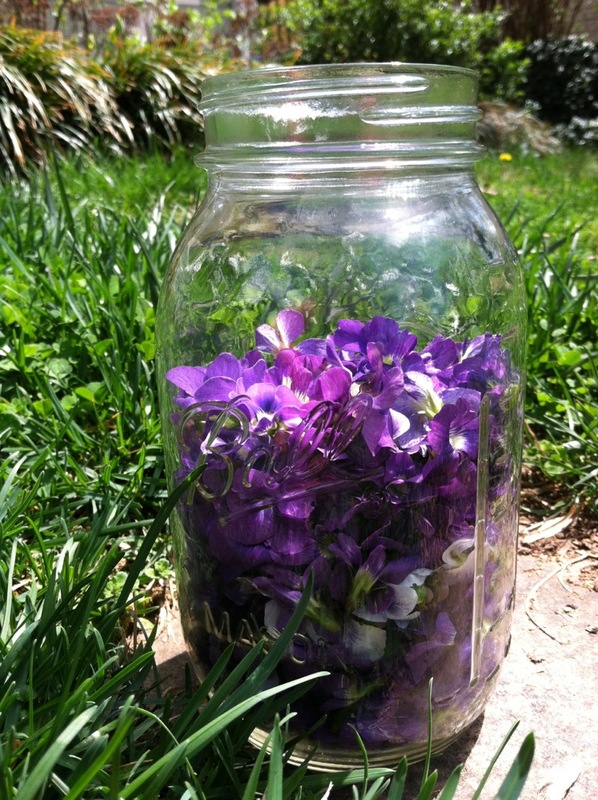 I began by gathering 2 cups of violets, making sure to choose only those blooms that were open and free of bites and blemishes. When you are harvesting edible wild flowers, make sure that you are picking them from locations that are free from pesticide or other chemical applications. 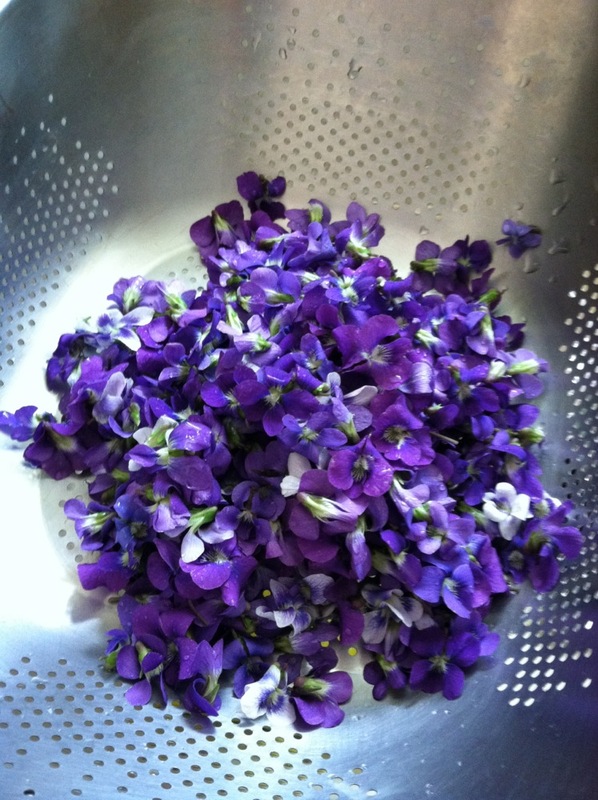 I placed the violets into a colander and rinsed them thoroughly. Then placed them in a Mason jar and covered them with 2 cups of boiling water. The water almost immediately began to turn a gorgeous sapphire blue! 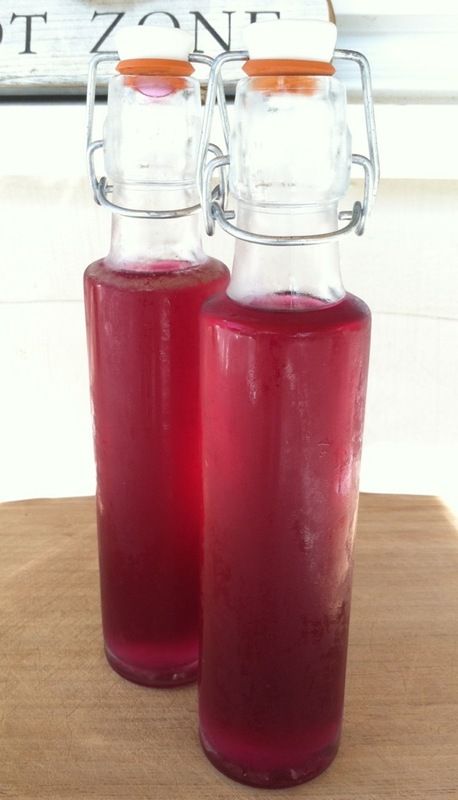 I let the violet infusion cool, then placed it in the refrigerator and let it steep for 24 hours. 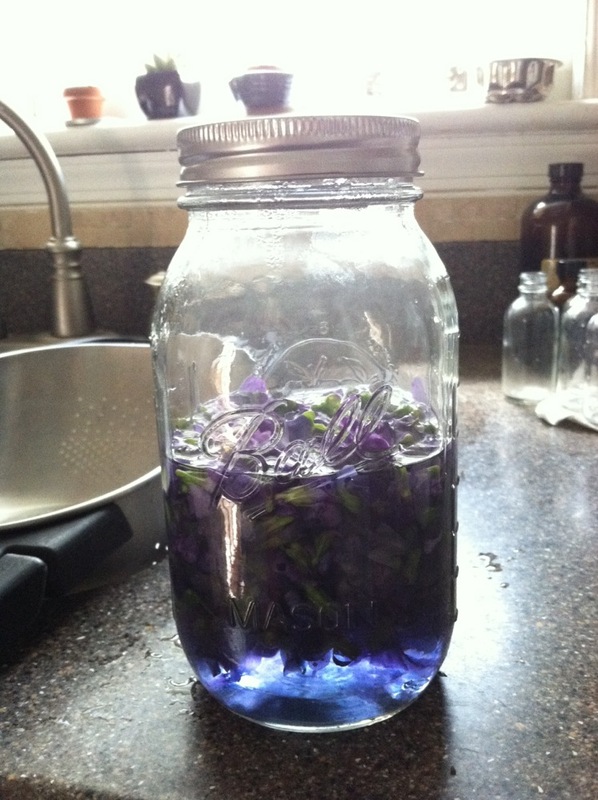 After 24 hours, I strained out the violet blossoms, squeezing them to get out all the gorgeous purple hue. 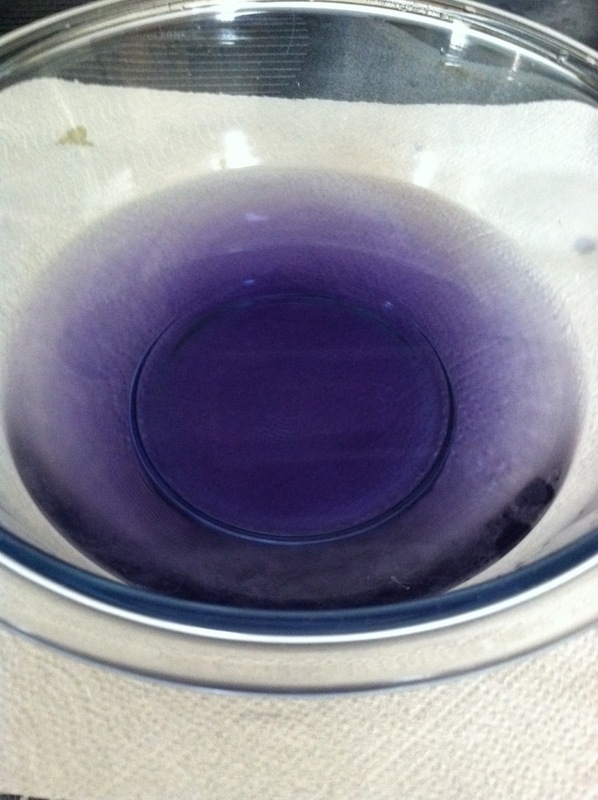 I placed some in a bowl so that I could show you what a brilliant color it made. 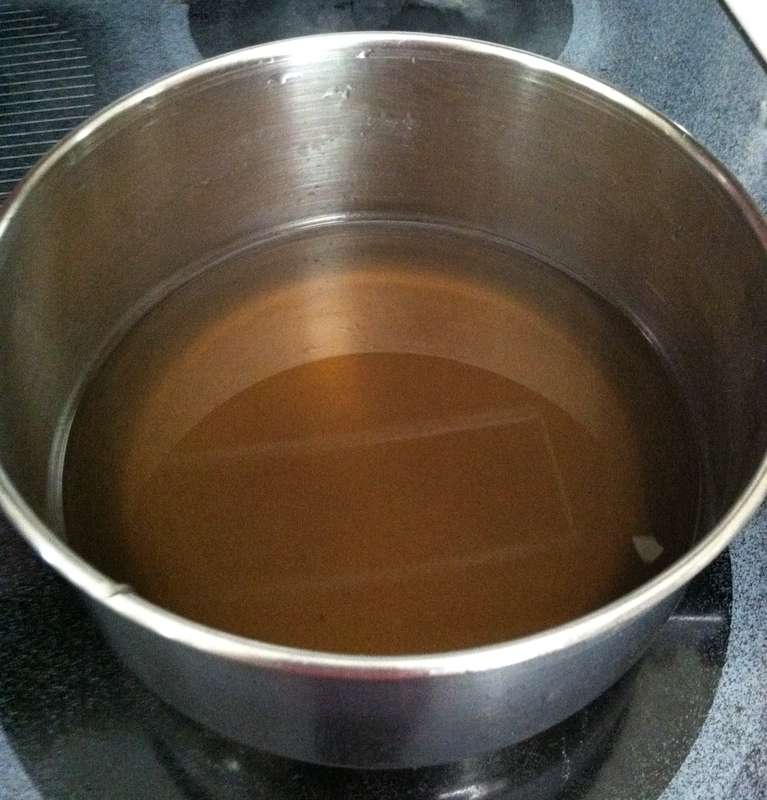 I placed the strained liquid into a heavy-bottomed saucepan. 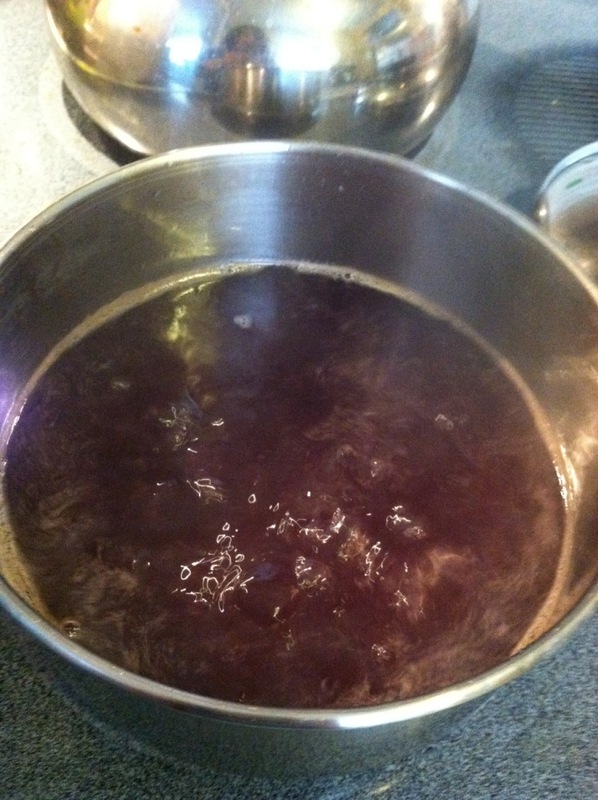 Then added 2 cups of organic cane sugar and let this mixture come to a boil. I then turned down the heat to medium and let it cook at a low boil for about 10 minutes, stirring often. 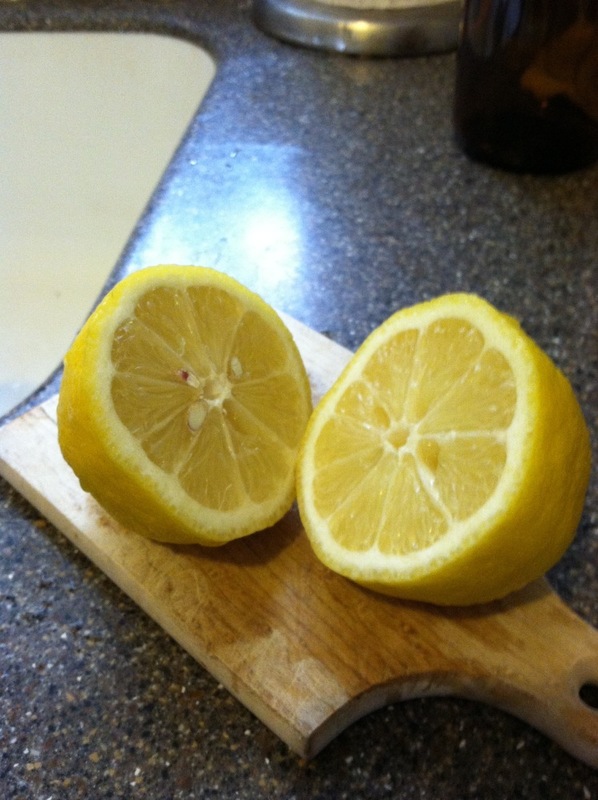 I removed the syrup from the heat, then added the strained juice of half a lemon. 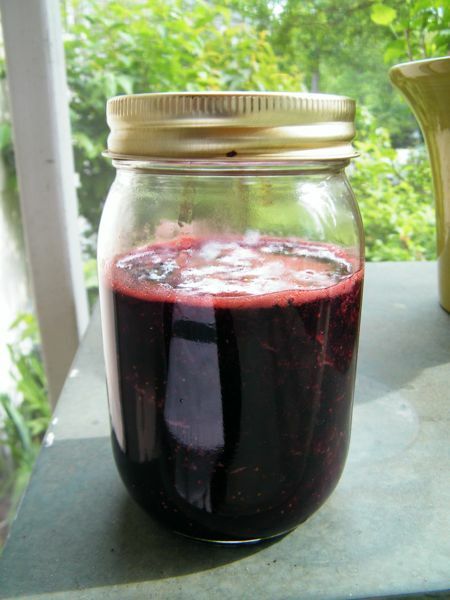 The acid from the lemon made the syrup go from deep violet to a beautiful magenta color. I then mixed the syrup, 50/50, with organic vodka and bottled it in sterilized capped glass jars, which I bought at the Container Store. After letting it sit for 2 weeks, it was ready to decant. 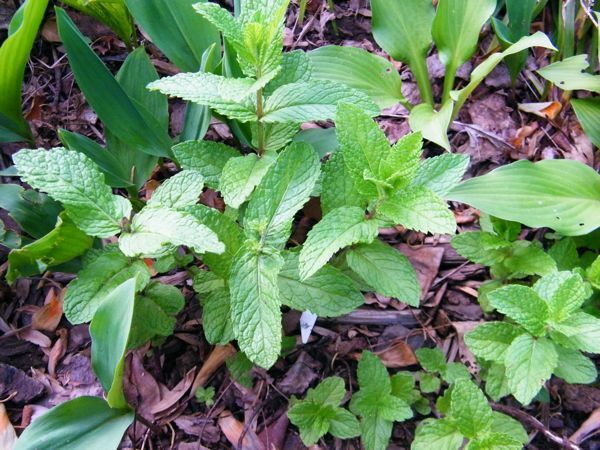 It is very sweet by itself, but makes a lovely addition to champagne or sparkling water. Enjoy! Back in July, I moved back to Arizona and I’m now newest member of the my Econista friend’s household. 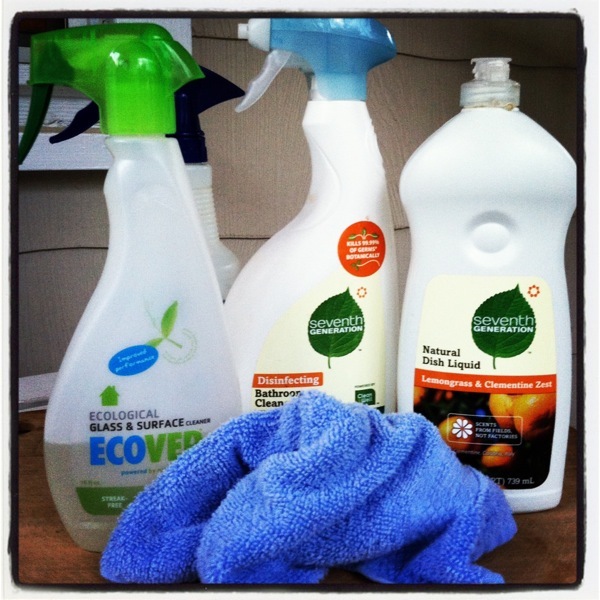 With the move came a shift of my lifestyle to the greener side of things, one of them being greener household cleaners. Basically the only things we use are vinegar, baking soda, and thieves all purpose cleaner. More people are using natural cleaning methods because most cleaning products on the market contain chemicals and toxins that create indoor air pollution and can lead to health side effects such as lung damage. Because there is no industry certification for what is “natural” or “eco-friendly” or “healthy,” household cleaner manufacturers can get away with greenwashing their products. So the Environmental Working Group (EWG) launched their “Online Guide to Healthy Cleaning” a few weeks ago, to let consumers have a better idea of what’s in their products and what effects these products might have on their consumers. Unlike food and cosmetics, it is not required that cleaning products list all of their ingredients, so EWG had to do some real digging to determine the full ingredient lists. Like EWG’s Skin Deep Database, the Online Guide to Healthy Cleaning really surprised me with the items that got a bad grade. Here’s an example: When I think toxic cleaners for some reason the first thing that popped into my head was Windex. So I typed in Windex, expecting to have a bad grade come up, which it did. Windex Original Glass Cleaner got the grade of D, so did Windex Nature’s Source Glass Cleaner and Windex Multi-Surface Vinegar Cleaner. So I wanted to try a more eco brand, thinking for sure the eco brand would get a better score. I looked at Seventh Generation’s window cleaner, Natural Glass & Surface Cleaner, Free & Clear, the score was better, but not by much, with a C grade, mainly because of the ingredient methylisothiazolinone. Frustrated, I clicked on the category “Glass/ Window Cleaner” to see who could best the C grade. Turns out of the 49 glass cleaners out there, 4 received an A: Simple Green Naturals Glass & Surface Care, Rosemary Mint; Whole Foods Market glass cleaner, unscented; Green Shield Organic Glass Cleaner, Fresh; and Citra-Solv Citra Clear Window & Glass Cleaner. 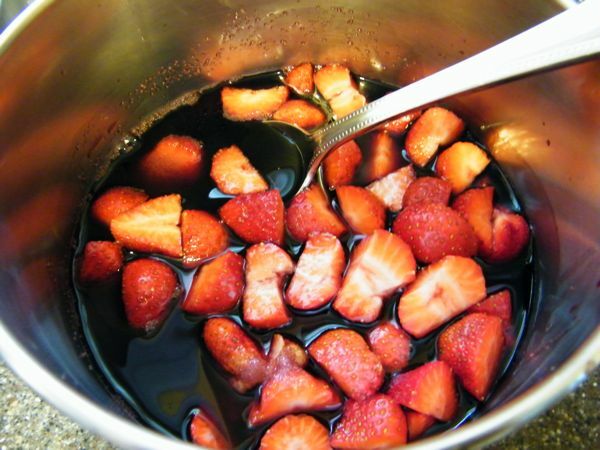 For the record, there are simple homemade DIY recipes out there, including pure vinegar; you can check them out here. Or try our Four Thieves Vinegar or All-Purpose Cleaner recipes! Happy Non-toxic cleaning everyone! Have any favorites? 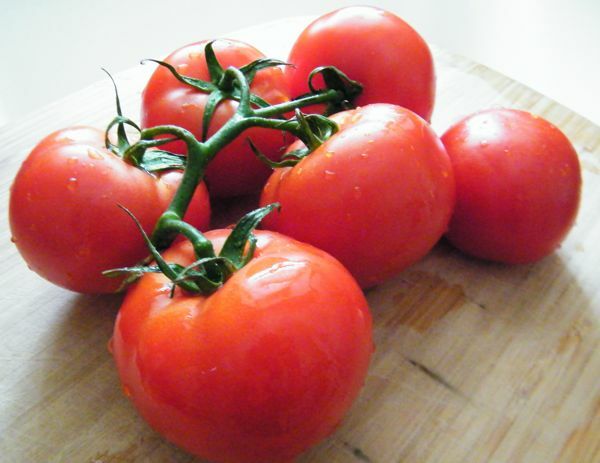 Perfect tomatoes. Ready to eat. No adornments necessary. 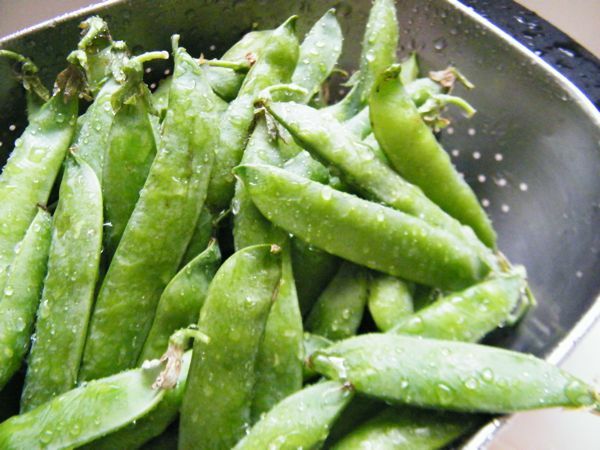 English peas. Preciously short season. Delicious in Minted Pea Soup. 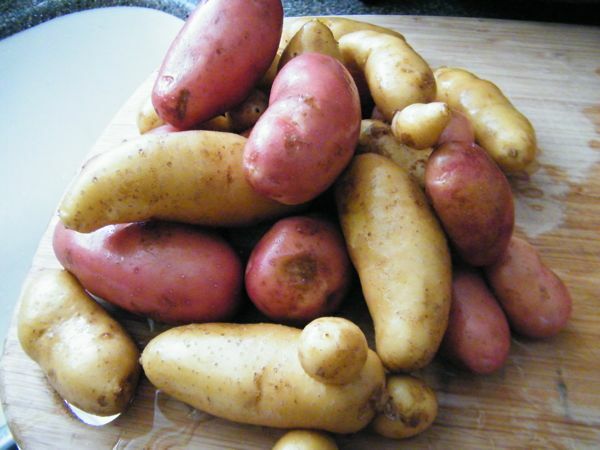 Fingerling potatoes. Red and white. To be roasted with garden herbs and olive oil. Strawberries. Last of the crop. Season came early this year. 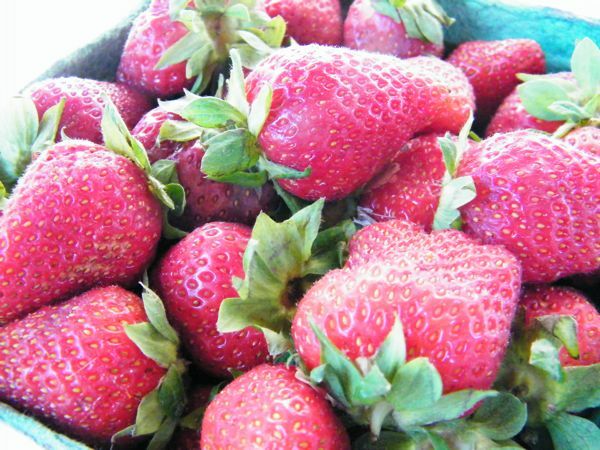 Perfect for Cold Strawberry Soup. 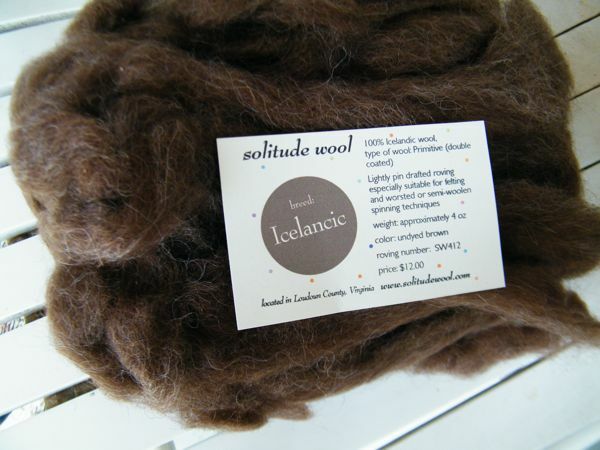 Icelancic lambs wool. Naturally gorgeous brown color. 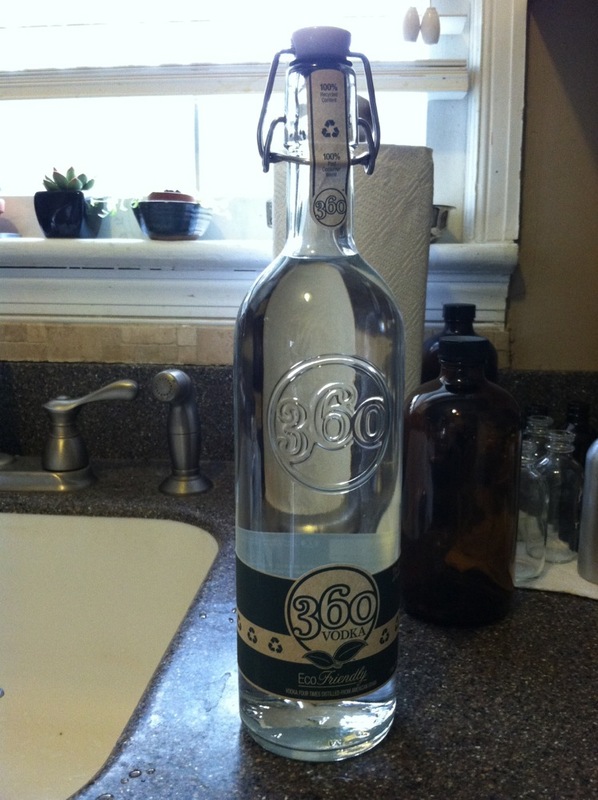 Will be used to make a batch of Fuzzy Soaps. 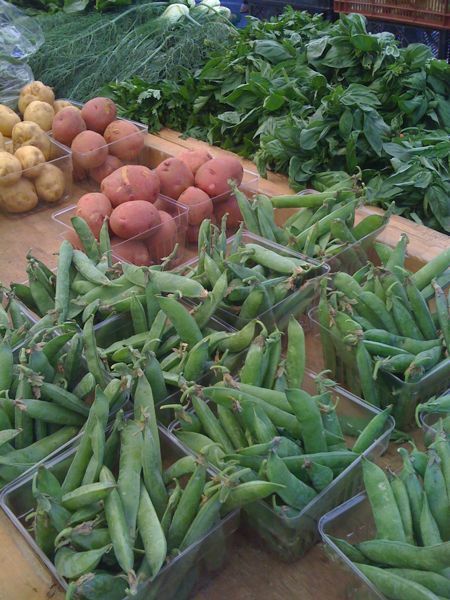 Peas and potatoes and basil. 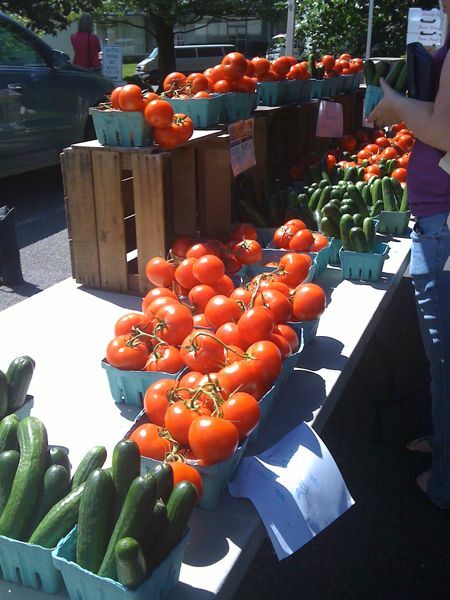 Tomatoes and cucumbers. A salad in the making. 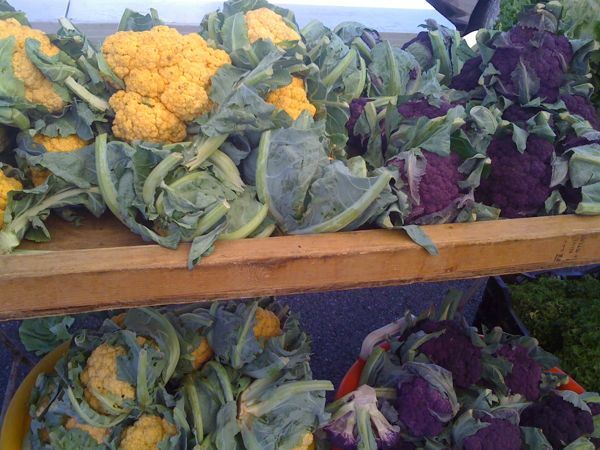 The jewel-toned cauliflower would look gorgeous on a crudité platter. 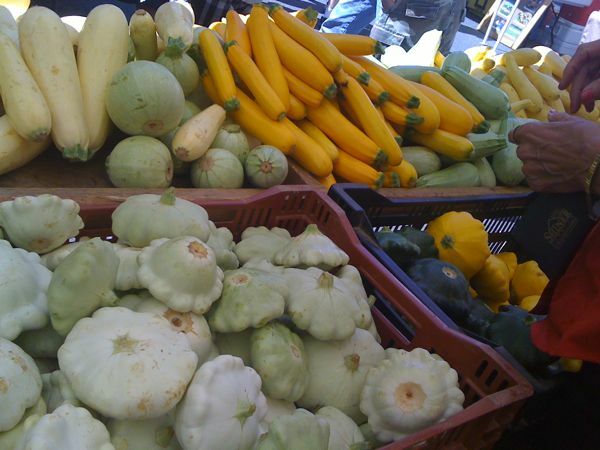 Nice variety of squash. My favorite are the oddly decorative and yummy patty pan. 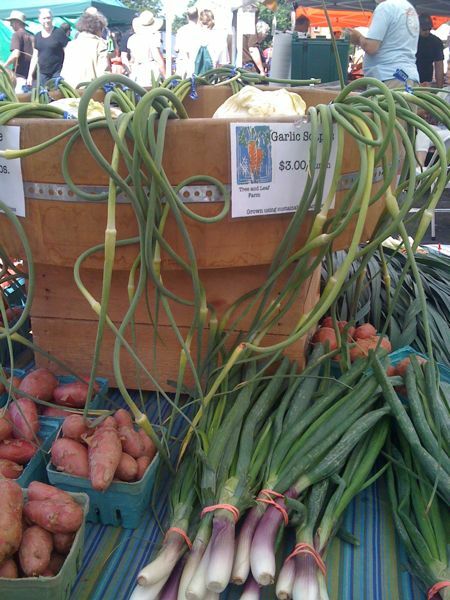 Garlic scapes have a very short season. They are wonderful in stir fries. 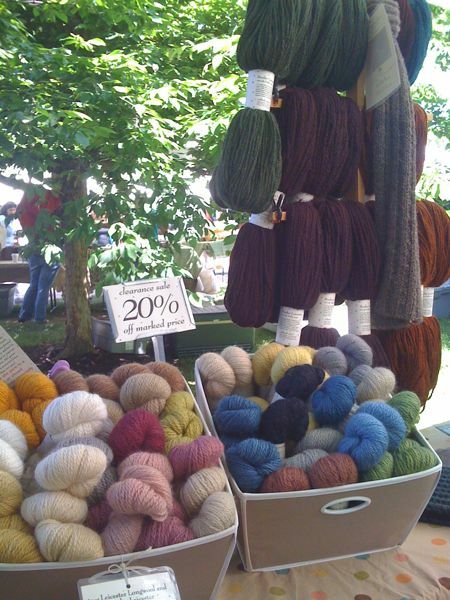 So happy to have Solitude Wool selling their wares now at the farmers market. The following post is by guest blogger, Julia Guarino. When I was five years old, I arrived home one day from kindergarten and announced to my parents that I was going to become a vegetarian. They were surprised, but as I seemed determined, they obliged, asking advice from my pediatrician as to how best meet my nutritional needs. By age ten, I had completely eliminated the fish and poultry that I sometimes ate, and I have been completely vegetarian ever since. In my final year of college, I moved into my first apartment, and in the excitement of newly possessing a kitchen, I subscribed to Vegetarian Times. It is full of wonderful recipes and tips on products to buy and restaurants to frequent for both lacto-ovo vegetarians (those who still consume eggs and dairy products), and vegans (those who have eliminated all animal products, including eggs, dairy and honey). 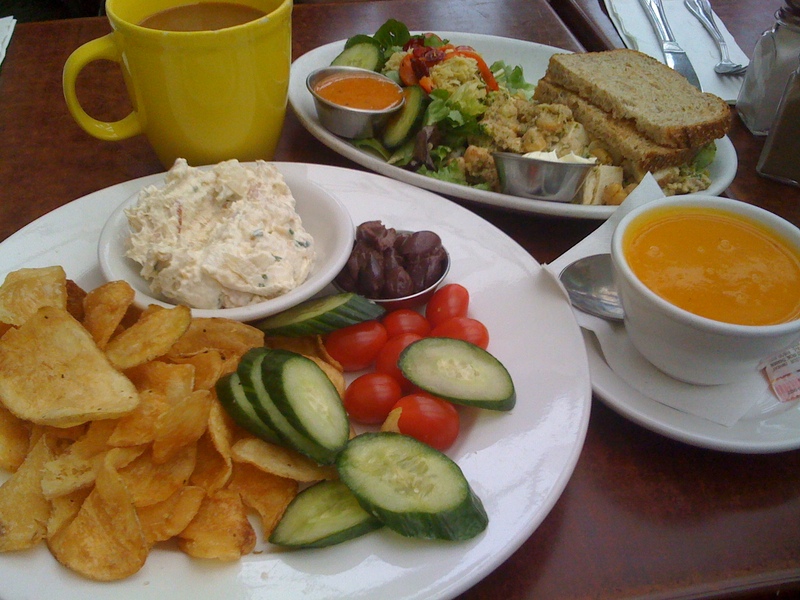 I had never really considered becoming vegan, because though I had long since chosen to use soy milk over cow’s milk and to replace butter with non-hydrogenated-oil-based margarine (like Smart Balance, which tastes remarkably similar), but I knew giving up cheese and eggs would take immense effort, and I wasn’t sure it was worth it. After all, not only did I enjoy these things, but as a vegetarian it was extremely difficult to order a meal at a restaurant with any protein in it that didn’t come from one of these two sources. However, as the year continued, several articles on the health benefits of veganism published in the Vegetarian Times encouraged me to eliminate more and more animal products from my diet, and the more I did so, the more I realized that it felt really good. I began to do some research. Could I really do this? Did it make sense to become vegan? Would the benefits outweigh the inconvenience? My research gave me a fairly clear answer: it is difficult, and you have to do it right, but if you’re willing to put it in the effort, it is worth it. I came across several medical studies done on vegan groups, providing evidence that a plant-based diet has enormous health benefits, including helping to prevent cancer, reversing the need for medication in type-2 diabetes patients, and more. Concern over the risks of malnourishment (as in the infamous case of the Queens baby) are not entirely unfounded, but seem to be fairly easy to avoid; as long as attention is paid to the vegan’s consumption of protein as well as some vitamins found in less concentrated amounts in non-vegan diets, such as vitamins B12, iron, calcium and zinc, even children live quite healthily on it. I cannot say that the switch is easy, and I have still not made it completely, but the less eggs and dairy I eat, the better I feel. Perhaps it is simply a feeling of accomplishment, but either way, I know I am doing better for my body, and it is worth it, despite the inconvenience. It’s strawberry season at the farmers markets in my area. I look forward to this time of year, and always take full advantage of the abundance of this wonderful fruit. While we eat a lot of them fresh, I like to use them in a variety of recipes, including salads, soups, smoothies and more. 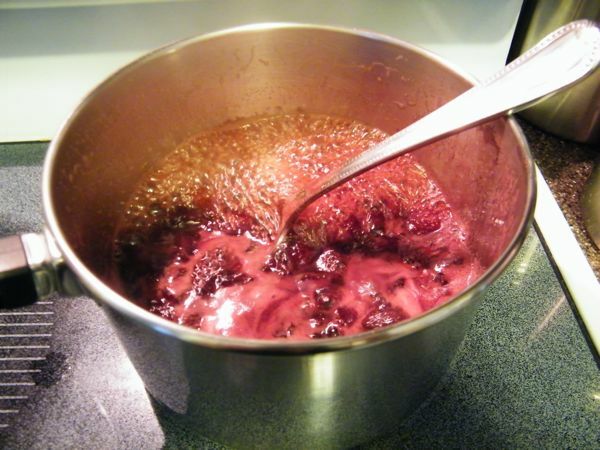 This year, I decided to make jam, and since I love cooking with wine, I thought I would substitute port for the water in this super simple recipe. Place all of the ingredients in a thick-bottomed saucepan. Cook over medium heat, stirring frequently to keep it from burning, and frequently scraping it from the sides of the pan. Cook until thickened (about 30-40 minutes). 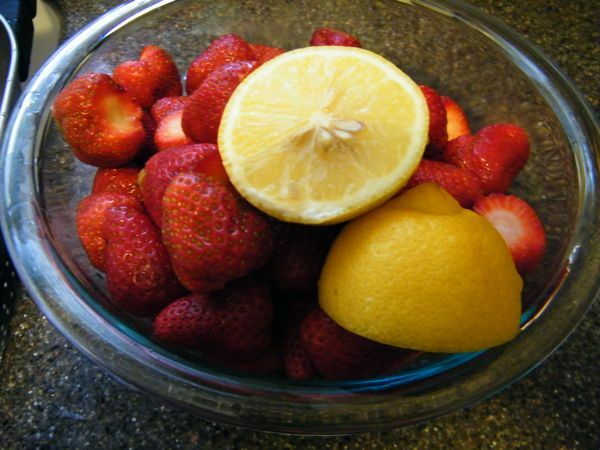 Pour into a clean container, and store in the refrigerator. Eat within 2 weeks (this should be absolutely no problem). 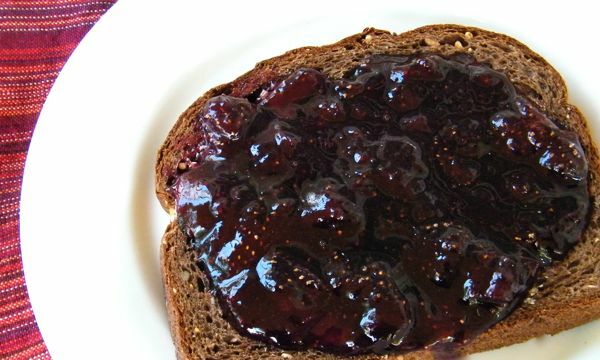 Enjoy on toast, or as a glaze for meat dishes. I adapted this recipe from a dish I had at Luna 61, a wonderful vegetarian restaurant in Tivoli, NY. 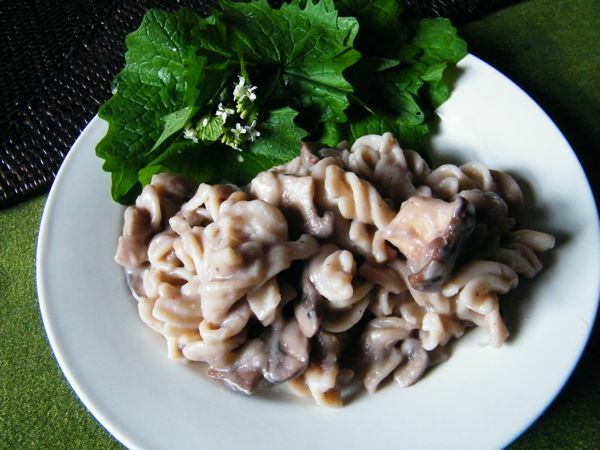 It is a stroganoff that uses mushrooms instead of meat. I took it to the next level by making it vegan and gluten free, while maintaining the awesome taste. The sherry and nutmeg are two key ingredients that give this dish its signature flavor. Saute the shallots in the olive oil over medium heat until the become translucent. Add the mushrooms, and saute until they begin to shrink and darken in color. Set them aside. In a large saucepan, heat the olive oil or melt the Earth Balance over medium heat, then add the flour, whisking it to blend thoroughly. 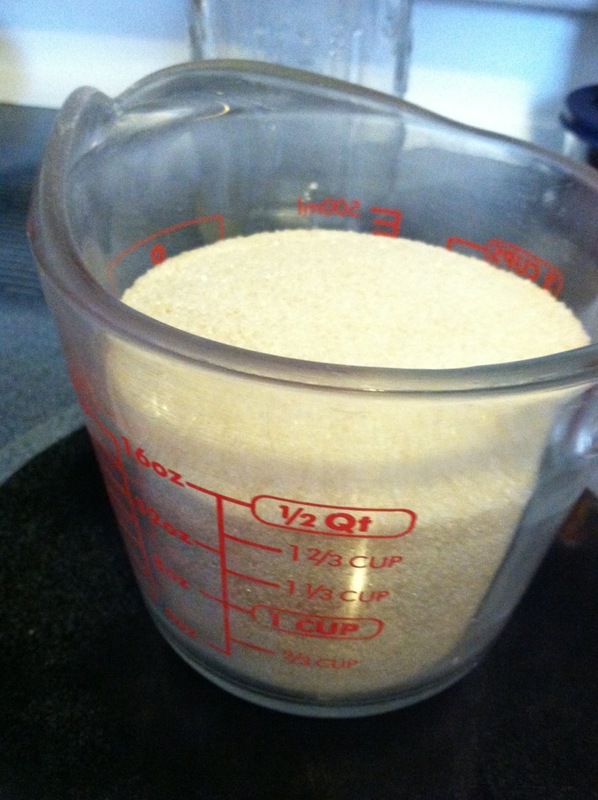 Cook for a minute or two to cook off the raw flour taste. Add the milk a bit at a time, continuing to whisk as you do this, so as to avoid lumps. Your goal is to create a thick white sauce. 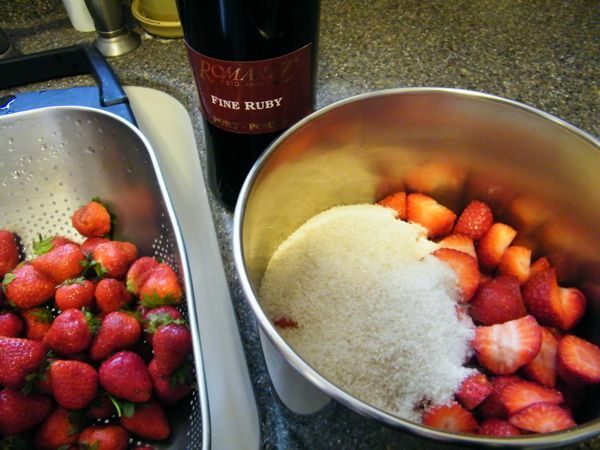 Once all of the milk has been integrated, cook and whisk for another minute, then whisk in the sherry. Whisk for another couple of minutes, then remove the sauce from the heat. Season your sauce with the nutmeg, salt and pepper. Then toss in the mushrooms and stir with spoon until they are well-integrated. Serve warm over pasta, with a side salad. Enjoy!